The Foundation for a Better Life is on a mission to instill what they hold to be classic Values into the errant youth of America…but who among today’s youth knows about the Duke? In what century are John Wayne’s ostensible opinions relevant? He’s famous among people 60 and older for embodying the 1950’s idea of what honor and courage in the 1880’s was all about. Indeed, nostalgia is a driving force of the Values: Pass it On campaign. A nostalgia for the idealized imagined past. Great for the older (white) generations of America who long for the golden age of TV and Movies, where men were men and women were…there, too, probably. The problem is that the imagined audience of this particular billboard is a boy or young man–someone who still takes advice from older mentors. The use of “son” as an address indicates as much. Is this boy supposed to care what Random Cowboy thinks just because he is a cowboy? Because he’s an older man? The ad clearly thinks the boy should care because he is John Wayne. 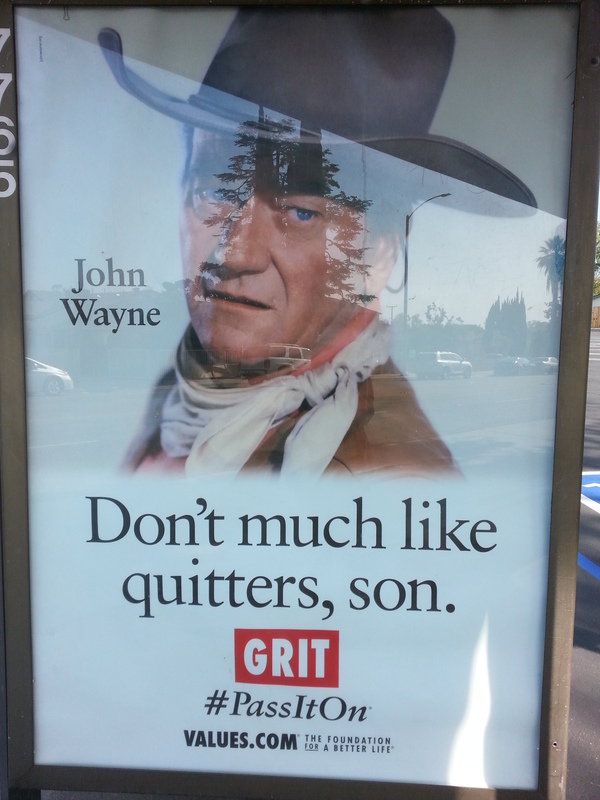 But the real boys who pass this billboard on the way to school do not, in all likelihood, have any idea who John Wayne is or why his good opinion should matter to them. The closest John Wayne has gotten to the contemporary zeitgeist is the True Grit remake of 2010. What I’m saying is that someone in one of the countless meetings that were held on the way to green-lighting this ad might have at least asked about its efficacy. Other prominent figures used to evangelize for the Foundation don’t share John Wayne’s temporal distance from the public stage. They are either currently famous, or benefit from a constant presence in public discourse since they were. Mr. Rogers and Michael J. Fox? Sure. Nelson Mandela? Absolutely. Shakespeare and Mozart? Shoe-ins. Mae Jemison and Jane Goodall? …at least kids will learn who they are. But the Duke? How many kids watch old Westerns these days? And do we really want that good-ole-boy morality to be the type that kids emulate? Maybe. But that doesn’t change the fact that this cowboy is a nonperson, a stranger–the weight of his message is considerably lighter when it isn’t bolstered by his reputation. If you clicked on the link above, you’d see there is indeed a narrative behind the billboard. They fill in that reputation–or at least the part of it they want to highlight. But it’s not a well-known narrative among “kids these days,” and it’s certainly not conveyed in the billboard’s message, much less alluded to. To be sure, John Wayne’s story of stick-to-itiveness, wild commercial success, and beating cancer only to have it beat him in the end, is inspirational in its way. This narrative posits that his success is do to his positive attitude and inner drive. To his never giving up. It’s simplistic, sure, but encouraging kids to keep trying isn’t inherently harmful. Wayne’s commitment to spreading awareness about cancer, and his children’s decision to establish a foundation to continue that work? That’s wonderful. No qualms there. Shout it from the mountain-tops and bus stops of America! But the billboard doesn’t tell us any of that. The billboard uses the image (and words) of an outmoded authority figure to chastise us for presumed laziness. Oh, for sure. I was focusing on the intended audience of the message, but the message itself definitely deserves the type of analysis you’ve given here. This ad is based on the same sinister”bootstraps” logic that plagues much of the anti-poor, racist rhetoric slung about these days. I would say that I do think they are trying to change things, but as you say, changing them back to what they imagine the “good ole days” were like.